Under most circumstances, this is something that you will never have to do for yourself. 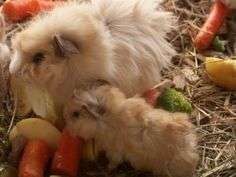 Guinea pig moms are extremely attentive, making sure that their babies are well looked after; that they�re always warm, fed, and safe. This can�t always be the case, and sometimes we have to take matters into our own hands. All mammals can die during childbirth, and even smaller ones like guinea pigs can suffer from this. She might have some sort of accident, or the family cat might somehow get into the cage � whatever the reason may be, there might be chance in the future if you�re breeding guinea pigs that something happens to mom, and you need to take over the responsibility. Fortunately, just like playing real money blackjack, raising guinea pigs by hand isn�t too difficult, but does take some patience and a gentle hand. Within the first few days of being born, the babies are completely helpless, and rely on their mothers for food and warmth. This is a critical time for ensuring their survival, and means having to feed them healthy food yourself. Getting hold of a nutritional supplement powder and mixing it with mashed pellets along with some pumpkin. Feed the babies with a small, bent spoon that allows the food to funnel into a smaller point. They should naturally take the food without too much fuss, and this will only be for the first couple of days, but note that they need to be fed every three hours or so, day and night. Guinea pigs already have fully-developed teeth after they are born, which means that they can start moving on to solid food fairly quickly. Avoid fruits and veggies at this point, but a mix of alfalfa hay and pellets should provide the nutrients and calcium that they need to grow stronger. This is also the point where they will begin bonding with you, and become more comfortable with human contact. After a while, you can start leaving various fruits and vegetables with them in the cage, and if they are ready, they will start eating on their own, and not long after can move on to a more consistent diet of pellets. It�s important that the babies have a safe and secure home to grow up in, and requires a little a few changes here and there to the usual environment that the adults are used to. Many cages are designed for adults, and as such, the bars are often too wide for the babies, which can pose the risk of them falling out. Laying a blanket around the edges is a good start, disallowing them from accidentally falling out. You can also lower and reposition the water bottle, giving them better access to fresh water. Always make sure it�s warm enough for them, and taking out the usual playthings is a good idea until they�re older. Guinea pigs mature quickly, and before long they will be ready to look after themselves. Those first few weeks are vital, however, and making sure they�re safe and well-fed is imperative to their survival and overall health.